Queer Chocolatier shares a birthday with my late grandmother who would be 88 years old today. I launched the business on this day to honor the person responsible for molding my early chocolate experiences. Today, one year after opening up and professionally working with chocolate, I am light years from where I thought I would be. And I couldn't be happier. Or more exhausted. Or more nervous. Or more determined. Basically, I'm more of everything. I'm turned to all the way to eleven. As we approach the opening of the Queer Chocolatier Chocolate House in the next few of weeks, I am taking a few moments to reflect upon this past year of all the growth and shaping of Queer Chocolatier. Cheri and I knew it would be important to start a business that we weren't finding as customers. We appreciate good quality products made my passionate folx, but we also wanted to become a business that would take those key components--quality and passion--and add them to our political mindset and be unapologetically transparent to those who engage with us. We started as an online business and added farmers' markets as ways to meet people and sell our products as well as our vision. It was an incredibly endearing process to make new friends and to be bare about who we are and what we stand for. I used to study farmers' markets as a sociologist so being a vendor at one was a complement to another chapter in my life. But being a scrappy young business the first few weeks led to a quick spurt of growth by obtaining a retail store front, despite still renting a kitchen and having lots of office supplies still at home. Having a retail space and weekly markets allowed me to add more truffle flavors to my offerings. In addition to my every day flavors, I incorporated monthly and seasonal flavors as well, along with the occasional fun flavors to play with. We started to receive a bit of press, first with the Ball State Daily News and, just before Christmas, Cheri and I were featured in the Wall St. Journal. What an extraordinary wrap up to the end of 2017! We also started offering Guided Chocolate Tasting Events in our cozy retail space. We wanted to make the experience of eating chocolate to be intentional, enlightening, fun, and more thoroughly delicious. During these events, we were even more transparent about where our chocolate comes from, our philosophy regarding business, and we were able to deepen relationships with folx in and around Muncie. There are doubtlessly individuals with more expertise in chocolate than I have, but I am endlessly curious and passionate about chocolate and I want to share that with anyone who might be in arm's reach or shouting distance. As such, my wife pushed me beyond my limitations and encouraged me to leap to the next branch in our business evolution: finding a brick and mortar space to build out my very own kitchen. A Chocolate House to call our own and to make everyone's. With a Chocolate House, we could expand our chocolate offerings, spread more knowledge about chocolate, and hold space for those who just want to be welcomed as they are. I loved the idea but I wasn't sure I had the confidence to accomplish this on my own. I was scared. I don't have any experience in opening a Very Serious Business and I don't have much in the way of mentors or all-important resources. But my wife believed in me enough to keep pushing and came up with our financing idea of opening our business up to microinvestors. We had eleven separate $1,000 investments plus an angel investor join us in our journey. Excuses and feet-dragging were replaced with YouTube and asking questions and getting comfortable with being ignorant in a lot of areas of regulation, construction, and business-to-business relationships. I decided to be open about not knowing things and trusting professionals who are paid to know the things I don't. Granted, this leaves a person vulnerable, and I was and am vulnerable, but in most cases I ended up being helped by trustworthy individuals. Even when I run into challenges from other folks, it isn't necessarily because they aren't trustworthy, but maybe they are in their own journey of transparency and are vulnerable to being seen as not knowledgeable. It is frustrating, but I have grown in my ability to be persistent. I am proud to say we will be out and open for business within a few weeks. Going into my second year of business is not really much different than when I was about to launch. I still feel like I'm in over my head but I love chocolate and don't want to stop working with it. I also love people and want to cook for them and share with them my passion for food. I hope those things about myself never change. But this upcoming second year will be marvelous and I am eager to discover the ways in which I will be surprised in how Queer Chocolatier grows. It takes a village to build a house...in the Village. I'm a headstrong, stubborn queer woman. Occasionally, I'm reminded of this but not always in a negative way. Expanding Queer Chocolatier into a chocolate house is one of the most positive ways I've been reminded that my stubbornness in doing things on my own is not needed here. Doing things on my own is, largely, a trait borne out of being a only child. It also comes from a place of lack. And, I'm more than sure that my own self-assuredness and ego has a role to play. But, I've learned (and am learning) that people want to help and rally around those they unapologetically love. 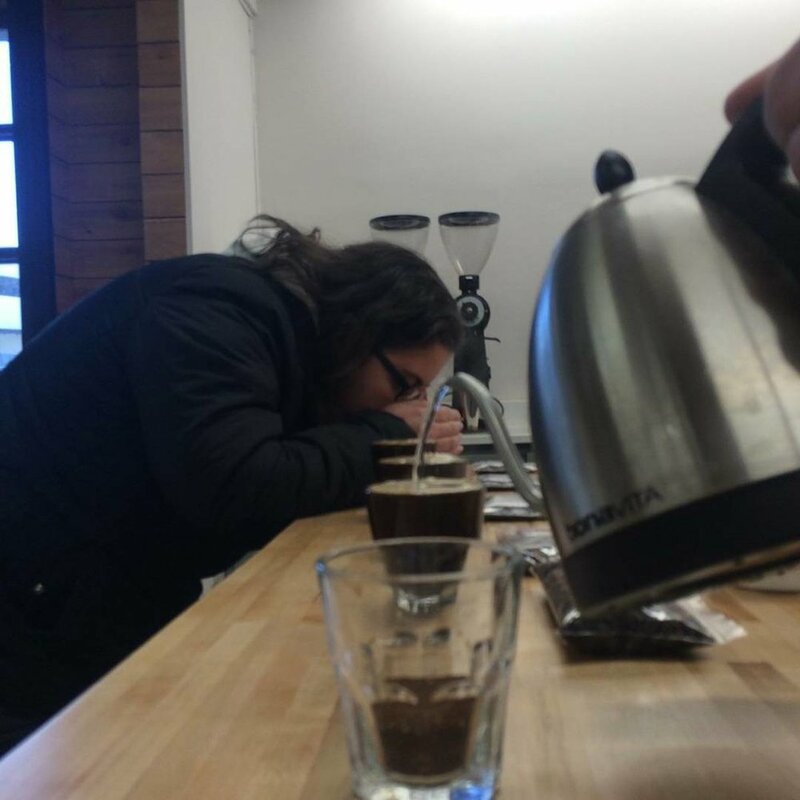 Coffee cupping for the first time at Quills Coffee in Louisville, KY. The new year has brought a whirlwind of joy in the form of new knowledge and new connections. I'm learning so much from so many that my head is on a happy lil swivel. Seemingly everyone I meet has a way of contributing and bettering the upcoming Queer Chocolatier House. If it weren't for all of these folks chipping in, sharing, absorbing, blending all of their knowledge, expertise and passion, I would not only have a slow and lonely go of it, it wouldn't have the depth and richness it is bound to have. I'm learning about business modeling from a friend I've known for a decade. I'm learning about branding philosophies from a kind and creative soul I've just met. I'm learning about coffee from roasters, equipment vendors, former baristas (including my wife) and former coffee shop managers. I'm learning about queerness and gender from countless people everyday. I'm learning about buildouts, remodels, and design from my father-in-law and my aunt along with others who are passionate about architecture and interior design style. How could one person build that wealth of knowledge on one's own?? Maybe it is possible. But then to take that knowledge and act on it? That seems like quite the task. Luckily we have folks who believe in us and our vision for our contribution to our community that they are contributing financially and knowledgeably. And I know I'll continue to need help along the way, and there are many ways you can join us in our venture. The Village will be made all the better and sweeter for their efforts. Thank you from the bottom of my headstrong, stubborn queer heart. Looking for ways to help outside of micro-investing for free truffles for life? Become a subscriber!